A quiet day in nature soothes the soul and gives one time to reflect and regroup for daily tasks to come. Yesterday was such a day. 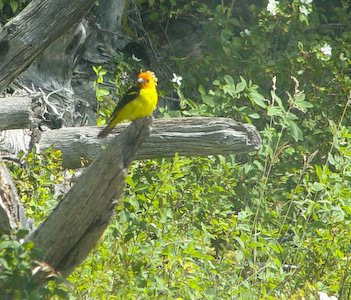 A pretty Western Tanager was waiting for us on Cabin Woods Road as we arrived at our cabin. So pretty and unafraid --- a perfect welcome committee of one! Later in the day another arrived and brightened up the day. Slowly but surely my embroidery project is reaching completion. DMC floss 320 was my color for the day, a beautiful sage green that matched the cabin paint. Quietly stitching in the coolness of the cabin where I could listen to the sounds of nature through an open window was so relaxing. 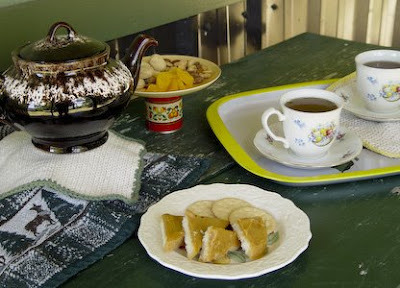 After awhile hunger pains started to surface, so I made an impromptu afternoon tea tray for Brent and me. Crackers, cookies, nuts, and open-faced sandwiches were garnished with little tangerine pieces. I really must plant some mint up there, as 'color' for the plates is hard to find without planning ahead. I wonder, do deer and elk like mint? And speaking of wild animals, last week on our walk we spent time observing animal tracks in the road and trails. Not far from the cabin we spotted a huge mountain lion print. Cougar, puma, mountain lion, panther --- all one and the same --- and always something to be wary about in the wild. When I go anywhere, my can of industrial size pepper spray goes with me! Brent's task of the day was to install a tank and get running water to the cabin. Using our old hot water tank from home, an RV pump, a filter, numerous valves and pipe, and a deep-cell battery --- he invented a water system that provides pressured running water from woodshed to cabin kitchen. Washing dishes was SO much fun! No more hauling water from pitcher to basin to kitchen sink for me! In the coolness of the evening we enjoyed a simple supper and then closed things up for another week. Homeward bound, we enjoyed deer who gracefully jumped over fences or gazed at us from meadows along the way. Serenity. A perfect day. ~~what a beautiful respite....I can almost feel the stillness and the sound of the wind in the fir trees.....wonderful pictures..Beautiful stitchery.. I can almost smell the out of doors. It reminds me of going to camp when I was younger. What a wonderful escape from life for short times. Absolutely wonderful way to capture some joy in a beautiful afternoon. Even the dishpan looks beautiful! What joy to have arrived in such a beautiful spot and be greeted so happily... Your day was as soothing to live(I'm sure) as it was for us to read about it. Sounds like a wonderful day. How great that you have running water now!! A mountain lion foot print!! Yikes!! Please be careful! Love that pretty little yellow bird! It certainly looked like a perfect day. It's it a blessing to have a retreat in the mountains? I love when you share pictures of your trips there. Now water... and finding joy in doing dishes. I completely understand. Love your embroidery project - can't wait to see the finished work! 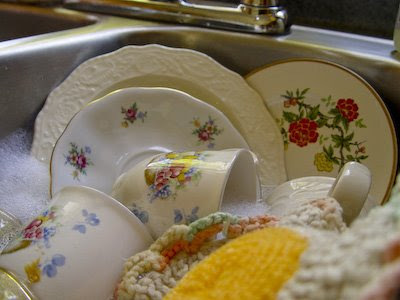 oh and I love your collection of dishes in the sink. 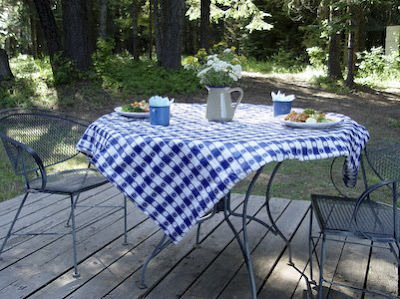 It's always amusting to me that I don't mind doing dishes one bit while camping. . how that works I have no idea. Wow-it certainly does sound like a perfect day! 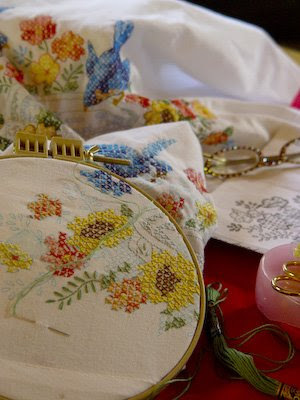 Time surrounded by nature is so soothing and your embroidery looks beautiful! Brent created quite the fix there-glad to hear he was able to device his own system so well! Hope you both can enjoy another day like this one soon! You time at the cabin looks just delightful! And your embroidery is gorgeous. Dirty dishes never looked so good! Esp. with a fried egg scrubbie! Oh, I loved this post. I could almost feel my own blood pressure lowering just thinking of the setting. Thank you for sharing your life with us.